Robyn (Miranda Raison) is woken by the swell rolling into a mysterious beach. Alone, she stumbles up the beach, flinching from the gurgles of an unseen beast. As she crests the ridge, she’s greeted with a vast muddy field. She checks her pulse; the results are inconclusive. This brilliant POV sequence opens Robin Schmidt and Gez Medinger’s (directors) award-winning high concept debut feature AfterDeath. And that (quite literally) is just the beginning . . .
Further exploring reveals a distant lighthouse and a solitary house. The lights are on. It turns out Robyn’s not alone. Upon entering, she’s greeted by the sight of a bizarrely over-dressed ménage à trois between Patricia, Livvy and Seb (Elarica Gallacher, Lorna Nickson Brown and Sam Keeley, respectively) and a repeatedly self-harming Livvy (Daniella Kertesz). Over the course of the next hour and a half, our group of characters have to work out where they are and why they’re going through this together. Secrets are kept, truths are revealed and thing’s get sinister. Fast. Raison makes for a terrific lead. Her Robyn is intensely driven, but never entirely trustworthy and working out her part in all of this makes for some of the most exhilarating moments in the film. Her co-stars also deliver a set of great performances, and Andrew Ellard’s (writer) character writing suits them all perfectly. They sell the tricksy narrative twists and turns perfectly. The fact that four of the five leads are women also ensures the film passes the famed Bechdel test, and then some. The female dominance adds a real kick to the drama, whilst also having thematic repercussions further down the line. The film also excels on a technical level. As well as looking great (keep an eye out for the fantastic canted angles! ), the sound design, CGI, lighting, set design and locations are all fantastic, and ably match up to the film’s grand ideas. AfterDeath is vast, yet small-scale. It deals with the afterlife, religion, guilt, sin, memories and a whole host of other things, without straying too far from a single house. Quite the achievement, wouldn’t you agree? 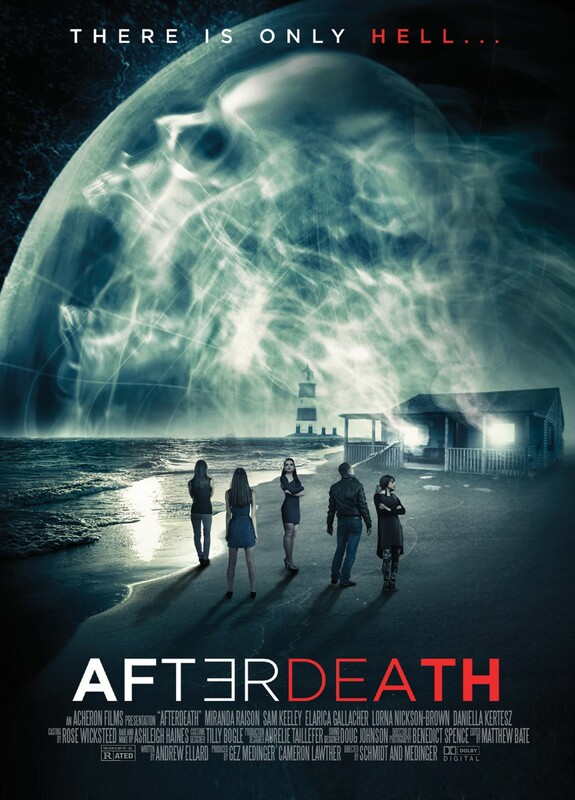 AfterDeath is out now on DVD/VOD via FrightFest Presents.